The Last Day at Last! I don’t know how I missed this awesome news, but I have just heard this morning that tomorrow is The Last Day! Well, the Last Day in California. I guess Australian true believers are going to have to wait until Sunday. Unless JC is better than Santa and can transcend the international dateline. Which He must be able to, right? I mean apart from being the inventor of Time, it would also be a bit unfair if those west of the good-old Bible-believin’ USA are able to watch the news and get a whole day’s warning that the Son is on the way, just because the Sun is still on the way. 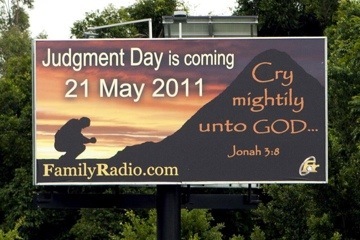 Harold Camping and his fundamentalist crowd at Family Radio, USA are going to be in the vanguard of the Rapture and leave the rest of us poor suckers here to muddle on without them. I can’t wait. No more God-inspired racist, homophobic, misogynistic, war-mongering, nationalistic ignoramuses. Just us poor old sinners. So here’s to a world without Christian fundamentalists. Now how long do we have to wait until all the other religious fundos leave this planet and let us get on with it? ~ by Garry on May 20, 2011.